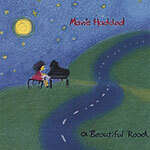 CD review: "A Beautiful Road"
This review first appeared in the June 8, 2006 issue of the North County Times. San Diego's Marie Haddad has an ethereal, other-worldly voice that could take her into the outer stylistic orbits of an Enya or Stevie Nicks. But grounded by her straight-ahead piano playing, her debut CD, "A Beautiful Road," is much more focused than the above two singers, and more interesting too. In fact, she reminds far more of a Kate Bush or Jane Siberry. The album opens with a trio of songs in a singer-songwriter folkie mode, "Obvious," "Didn't Deserve It" and "Wishing Well." Each one is intriguing, but only hint at how good this album will get before it's over. About halfway through the dozen songs here, on "Faster," the album shifts gears into more of an art rock approach. Odd little time shifts, a right channel/left channel call and response from Haddad to Haddad  it all adds up to make the listener realize things are getting very intriguing. "Why? Why not." dabbles in a new age mode, with a deep echo effect giving a lush sheen to Haddad's voice and piano. The overarching tension of "Red" reaches into XTC and Marillion territory. Things never get too weird; Haddad's songs are all built around friendly melodies, which counters her more experimental arrangements. And that voice will hold your attention whatever she's singing.